Dscreet has been hitting up the streets of East London for the last few years with his colourful Owls. 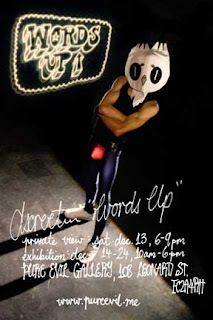 Saturday the 13th December sees the opening of his first solo show titled " WORD UP" at the Pure Evil Gallery. The exhibition kicks off with a private view at 6pm this evening. THe show will run until the 24th December.